Unilever's Sure deodorant brand has created a tactical ad that plays on a new phenomenon in football, the referee's white spray, first seen by UK audiences during the World Cup. The ad by DLKW Lowe references the white spray referees are using at the World Cup to stop the opposition edging too near the attackers during a free kick. The marks vanish after a short period. The spray, which has used for several years by South American football referees but never in the UK, comes in a lightweight aerosol can so referees can carry it around easily during a match. DLKW Lowe has exploited the attention the spray is receiving in UK media by creating a picture-led campaign showing the white spray in action, along with an image of a Sure deodorant can. 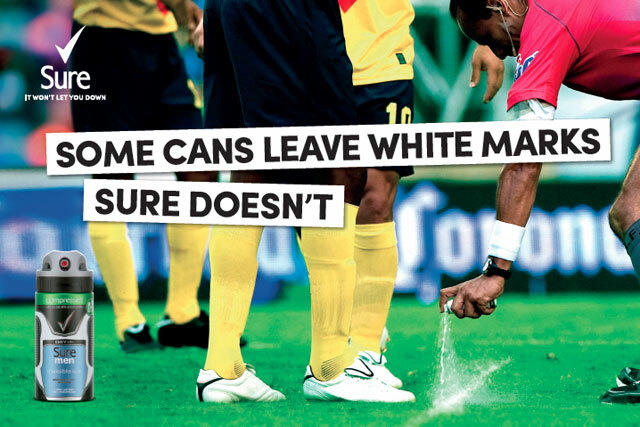 The ad’s copy says: "Some cans leave white marks. Sure doesn’t"
The campaign ran in newspapers including Metro, The Sun and the Daily Star, and will also be propagated on social media sites in an attempt to reach a global audience. The global creative director for the ad was Christine Jones and the creative team was Seb Housden and Ben McCarthy, all from DLKW Lowe. The planner was Lex Robinson and the media agency was Mindshare. A spokeswoman for DLKW Lowe said: "With World Cup football underway, the referee’s white spray has been the topic of many conversations. To join the populist conversation, we developed a topical press and online campaign that hero’ed Sure’s product ‘Sure Men Invisible Ice’. "It was a neat way to align Sure’s product positioning of ‘superior white mark protection’ into populist culture."